Sekhem is the modern day version of an ancient system of wisdom taught in the temples of early Egyptian times. At the time, the word Sekhem was not related directly with healing but to a higher state of consciousness. The ancient Egyptian meaning of Sekhem related to the state of consciousness equivalent to the all-knowingness of the first three days of the Afterlife which the Tibetans called the “Bardo” and the ancient Egyptians called the “Sekhem”. Helen Belot Sekhem Master TeacherAfter being introduced to energy healing in the 1980’s, Helen Belôt who has memories of herself as a High Priest in the very early temples, reintroduced Sekhem to the modern world in the 1990’s in an updated system to suit today’s current conditions thus completing a task she was incarnated to do in this lifetime. Different from Reiki and Seichim, Sekhem is a channelled energy that heals on all levels and can be best described as ultimate healing. Sekhem has surfaced now to assist humanity to change their vibrational rate quickly and easily so that both mankind and the earth may ascend to their higher purpose. The knowledge and practice of Sekhem is taught by Australia based Helen Belôt who was energetically directed to develop Sekhem and offers it in the form of four levels: One, Two, Advanced, and Masters. The courses are designed to provide individuals with an insight into how to access and use Sekhem energy for the purposes of self healing, healing of others, personal transformation, and personal development. Successful participants in the Master classes will hopefully conduct their own Sekhem courses and provide the unique experience of Sekhem to many others. A word of warning if you have learnt a similar sounding course to Sekhem and the initiation was done by the absentee method, be aware that you are connected to that teacher and it is NOT this Sekhem that you have learnt. Sekhem is an ongoing energy system that changes and develops as individuals and the mass consciousness can support those changes. It has the highest vibration of the healing systems. There is a clarity, purity and gentleness to this energy that is truly amazing. At the same time it is awe inspiring in the results it brings, for it works instantaneously on the body, mind, emotions and spirit. Sekhem reacts specifically to you and your intentions for the use of this energy and what you ask for is what you get. Practitioners claim that Sekhem is the “parent” of all hands on energy healing systems. Helen Belot SekhemThe energy is very balanced and has a gentle loving aspect that currently is attributed to being feminine. Over the last two and a half thousand years, mankind has lost the balance of male and female and Sekhem provides for a return of that balance, not just between the sexes but within each individual and Sekhem helps us to do this very quickly and with great ease. Sekhem works on a totally different concept and philosophy to other energy healing systems and although there are some similar sounding systems, none can compare with this high vibrational energy that works at the very soul level. It assists you to take responsibility for your life, to heal, to grow both personally and spiritually and so you become more of who you really are. Sekhem is a complete energy system that is derived from the temples of ancient Egypt and has been trademarked by Helen Belôt. It is described as being very gentle, yet ultra powerful in what it delivers to the individual. The energy has a clarity and purity that facilitates empowerment, inspiration, creativity and a joyful thirst for living. More than words can capture, it is something to be experienced. Today, Sekhem remains an astonishing force thanks to a small group of people located in every continent dedicated to preserving the purity of the energy. The word Sekhem and the logo are trademarked in the EU and China. The word Sekhem with the logo underneath is trademarked in Australia and Hong Kong. The single circular device logo is trademarked in EU, China, US, and Australia. 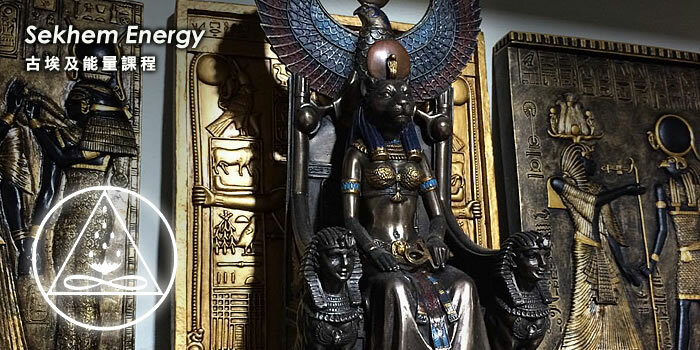 The Goddess Sekhmet whose name means “power” or “might” has come to be associated with SEKHEM as a guardian who protects this sublime energy. Prerequiste : You must be a Reiki Master to receive the empowerment.